Mehron Color Makeup Palette. Colors Left to Right: Black, Clown White, Red, Yellow, and Blue. 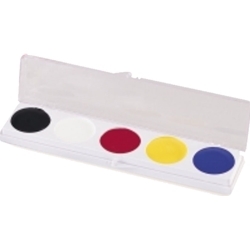 Identical to the Clown Palette with the exception of Yellow rather than Auguste color.